M1: Unit 1: Chapter 2 – Where to start? Chapte r 2: Where to Start? 2.1 There is no clearly marked starting point for translation studies to begin, because there is no obvious dividing line between traditional and modern, ‘occasional’ and ‘academic’, personal and ‘scholarly’ discourses on translation. If we regard all reflection on translation as a form of theory, we can trace the Western tradition back to Roman times and beyond. If we want to highlight sustained, serious thought on translation, we can go back at least as far as the Romantic age in Europe. Other cultures will have their own histories. In other words, the starting point is not automatically given. 2.2 However if, for practical reasons, we have to pick a starting point that allows for a direct connection with contemporary research in the field now known (in English) as ‘translation studies’, I would point to roughly the middle of the twentieth century. That period witnessed a spectacular increase in the volume of translation worldwide, and particularly in the industrialized world. 2.3 There are economic, social and technological factors which brought this development about (think of population migrations, international organisations and international business, inventions in communication technology since the beginning of the twentieth century etc.). We need to pick up only one striking aspect: the professionalisation of translation. It manifests itself, for example, in the increased specialisation of individual translators, the large investments in machine translation, the emergence of translation agencies, and the growth of national and international translators’ associations. Research into machine translation began in earnest in the early 1950s; the EU Systran system today produces a million pages per year, not much less than all human EU translators (well over a thousand of them) together. Until 1950 only France and Denmark had translators’ associations; today just about every industrialized country in the world has them. The International Translators’ Federation (`Fédération Internationale des Traducteurs’, FIT), which is in fact an association of translators’ associations, was set up in 1953. 2.4 The demand for translation, together with the increasing professionalisation of translation, explains the appearance of institutes for translator training. As far as I can see, it is in the context of these institutes that teachers and researchers first began to pay systematic and sustained attention to translation as an object of study. 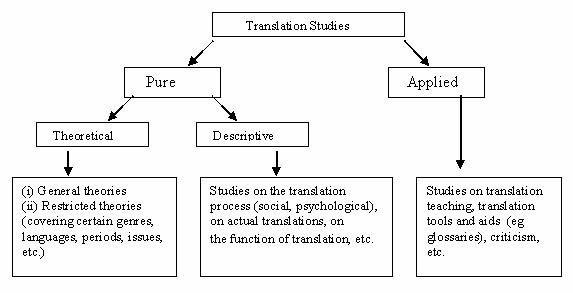 In other words, translation studies as a discipline is a rather novel thing. Sociology and anthropology, for example, date from the nineteenth and early twentieth century respectively. Comparative literature is usually traced back to the early nineteenth century. But in the 1960s, for example, the American Bible translator and pioneer translation scholar Eugene Nida still spoke of a discipline devoted to issues of translation as little more than a remote possibility, a pious wish. 2.6 Today translation studies has gained a certain, if limited, degree of recognition in the academic community. It has established a certain material infrastructure in the form of specialized courses, newsletters, journals, a conference circuit, scholarly associations and the like. It also possesses a certain intellectual infrastructure: there is a range of more or less coherent approaches and lines of thought, some of which have even been identified as ‘schools’, and there is ongoing debate about the relative merits of individual approaches. 2.7 Nonetheless, the precariousness and insecurity of the discipline shows in the fact that it has only a very few large-scale encyclopedic reference works, and they are all of recent date, 1995 onwards. It possesses very few comprehensive historical studies. The relative youth and instability of translation studies also shows in the widely divergent views on such basic issues as the scope, aims and methods of the discipline, as will become clear. 2.8 The reasons for this take us straight back to the beginning of the systematic attention paid to translation, in institutes for the training of professional translators. Those teaching in such institutes did so with a particular purpose in mind. It was their job to produceproperly qualified professional translators. Most of these researchers and translation teachers were also linguists. Other perspectives were explored later. 2.9 In recent decades various other people with backgrounds in other fields of study have developed an interest in translation. They include literary theorists and historians, but also, for example, anthrolopologists, information theorists, semioticians andphilosophers from Willard van Orman Quine and Donald Davidson to Jacques Derrida. To set the scene for an overview of developments in translation studies, let us begin with what we might call the traditional approach: the combination of practical translator training with linguistics. This is the subject of the next chapter.